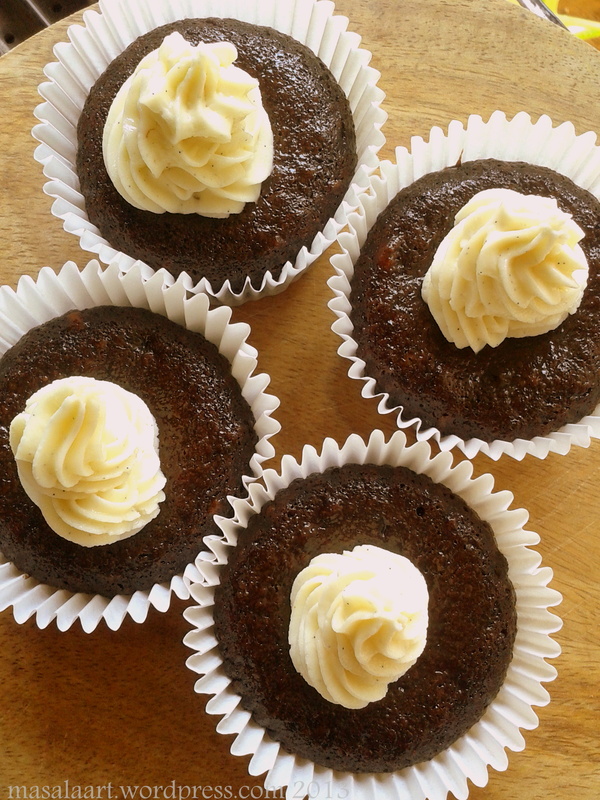 So like I told you earlier, I spent the whole of last week testing out various eggless and vegan cupcake recipes. I found this recipe on Love & Olive Oil as well, and what drew me in was the banana. I know the usual winning combos are banana-caramel and banana-cinnamon; but I quite like banana and chocolate. I enjoy that drizzle of chocolate sauce over a banana split. And of course, I adore chocolate chips in my banana bread. So when I saw this recipe for a chocolate and banana cupcake, I had a feeling it would be a winner. Plus, since they are available in Mumbai year-round, I rarely pass up a dessert recipe with bananas. And I struck gold with this one. It’s so crumbly, so delicious- and no eggs or dairy! Who’d have thunk it? I’d always wondered whether vegan cakes could actually taste good, and now I know they can! I made some vanilla bean buttercream to top it off- and trust me, once you have used a real vanilla bean, you will ditch the extract for good! The speckled frosting looks beautiful, and tastes even better. As usual, I tweaked the recipe- I added some almond meal for extra texture and richness. It marries wonderfully with the mashed banana for a dense, chocolatey cupcake. Preheat oven to 170 C and line a cupcake tray with liners. Put the first 5 ingredients in a bowl and whisk well so that everything is evenly combined. Try and smoothen out as many lumps as you can. In a separate larger mixing bowl, sift together the flour, cocoa powder, baking powder, baking soda, salt, cinnamon and almond meal. Mix well till combined. Create a well in the centre of the dry ingredients and pour in your wet mixture. Fold well till evenly combined and there are no streaks of flour. Don’t overmix or you will get a tough cake. Scoop into your lined cupcake moulds, filling a little more than halfway, and bake for 20-25 minutes, or until a toothpick inserted comes out clean. Allow cupcakes to cool completely before frosting. Beat all the ingredients together in a bowl until light and fluffy. That’s it! 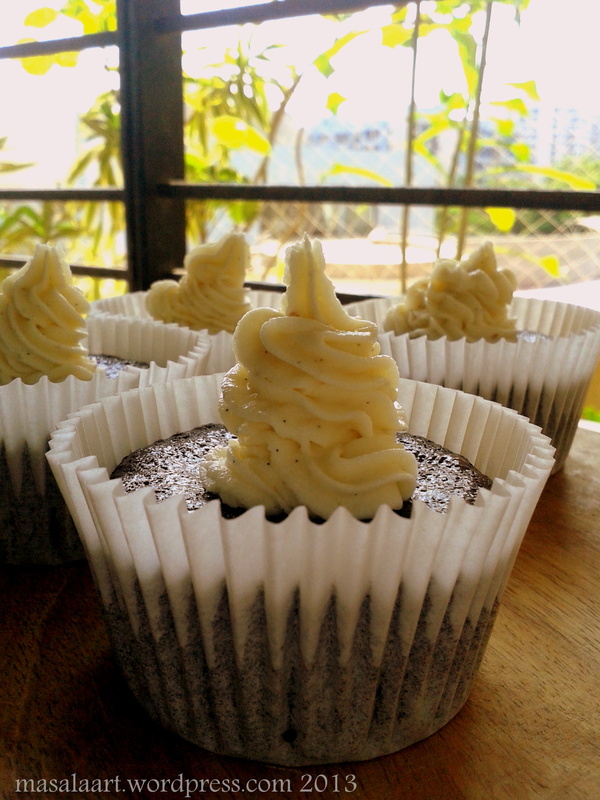 Once your cupcakes are cooled, you can frost. I made little big-top like swirls! I’m sorry about the cupcake measures being in cups and the frosting in grams. Still figuring it out! Lovely and yummy post with yummy cakes..I will also try to make this yummy cakes.Thanks for sharing the direction to make cupcakes. Yeah…even I felt that the vegan cake gave room for some buttery indulgence as frosting. Though I did find some great frosting recipes with soy milk! love the idea of frosting here 🙂 i need to use up some uberripe bananas soon!! Thanks for stopping by Dixya! I never throw away overripe bananas now- always make some banana bread or mash it for cake! Thanks Uru! Nowhere near your easter cake though! Wow–these look and sound wonderful! Hey thanks so much for stopping by, Deanna! I am going through Sole Kitchen right now and I am loving your concept of S.O.L.E.! Thanks! I have really enjoyed reading your posts!